1. No AAA? How did our Ancestors get here? Depending on what your ancestors migration trail may be in America, have you ever thought that they came without having Triple A maps and guidebooks? 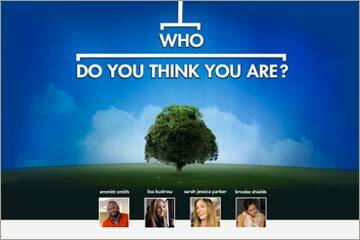 Knowing why and how our ancestors moved west provides clues and insights into our ancestors' lives. Tracing our foremothers can often be difficult; however, knowing the laws at a particular time can provide information and clues about our female ancestors that most genealogists overlook. This session provides information on finding photographs or seeking identification of photographs of our ancestors from distant relatives, libraries, and on the net, preserving, and sharing our photographs with others in using cameras, computer technology and the net. During this session, Social History will be discussed to find clues about our ancestors and their lives as well as using Social History to write family histories through fleshing out the bones of information from our genealogical research. This is the forty third in the series on the Presidents of EWGS leading up to the 75th anniversary in 2010. See the previous posts on Samuel Pool Weaver, Leora Cookingham Thiel, Susan Marie West Jack, Ruth Churchill Austin, Alfred Denman, Florence Ballou Brown, Harriet Jefferson Pinkham, Mary Elizabeth Dow Maltbie, Achsah Maltbie Rawlings, Lee DeGolyer Patchen, Susie Elliott Faubion, Edith Webb Nelson, Carrie Teats Lartigue, Guy Alfred Clumpner, Grace Ellis Woodward, Mabel Rue Frederick, Nell Hartman Peel, Edwin Allan Poole, Mabel Enid Rice Conrad, Helen Elizabeth Osborne Rowe, Dr. Herbert Hoover Osborne, Jane Merritt Logie Webster, Beatrice Cutler Mitcham, Marie E. Stone Larson, Lorena May Saylor Wildman, Raymond J. Fisher, Grace E. Kelso Garner , Catherine P. Cornehl Hyslop, Barbara J. Wirt Clarkson, Ruby L. Simonson McNeill, Jeanne J. Jones Holder , Jeanne M. Polumsky Coe , Maxine E. LeGrant Pence, Mary Kay McGlothlin Gant, Elizabeth Dale Hastin Smith, Bette Butcher Topp, Gordon Dean Clay, John R. Zeimantz, Shirley E. Penna-Oakes, Marvelene E. Roach Carney, Susan Beamer, and C. William (Bill) Hire. 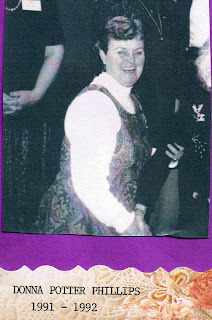 Donna Ruth Potter-Phillips was EWGS President in 1991 and 1992 and is now in 2010 EWGS President again. Donna was born in Vicksburg, Michigan to Francis Harold Potter and June Magdalen Gurney and on September 21, 1961 Donna married John Charles Phillips in Coeur d'Alene, Idaho. What can I say about Donna? She first appears in the EWGS member list in 1976; she is one of the original incorporaters of EWGS. Since she came along at that time she authored several surname booklets, including Gilbert Gallery, Potter Profiles, Oswald Outline, and Texas Queries. Donna has taught beginners' classes, and has probably gotten more people to join EWGS than anyone else. 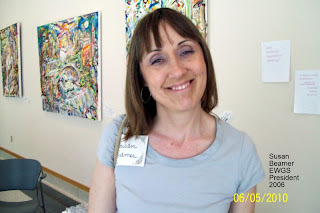 Donna has been program chairman and presenter at many seminars. It was her idea to run the multiple presentations at the same time for EWGS seminars like the national seminars. 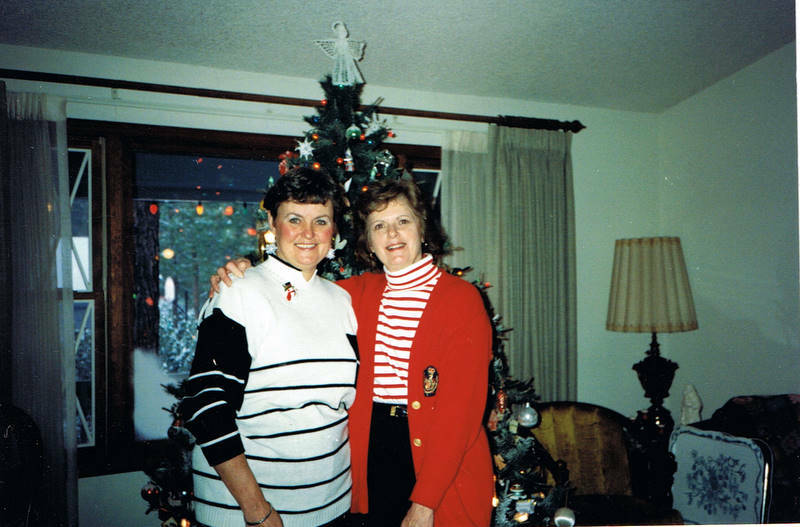 Donna wrote the Heritage Hunting column in the Spokane Daily Chronicle for years (Note: the Spokane Chronicle is online in Google News Archive so you can read her columns online). Donna also wrote many articles for the Bulletin, as well as wrote the News Hotline column in that publication for years. I think Donna has also written articles for nearly every genealogical magazine published in the last thirty years. If you read the old Bulletin, you will see Donna donated many books and microfilms to EWGS and the library. She is listed as a co-author of one book in the Spokane Public Library, and has volunteered for nearly every call for volunteers including being a gene helper at the library. Donna has indexed records for the Washington State Digital Archives, and has been the FGS delegate for as long as I can remember. Donna is also the "mother hen" for the Annual Christmas Tour at Salt Lake City with Leland Meitzler. (If you ever get a chance to do the Christmas Tour, it is a wonderful way to visit the Family History Library). For the Spring 1992 seminar EWGS hosted Dr. Brian Trainor from Ireland at Cavanaughs River Inn March 21, 1992, which cost $15.00. The October workshop was October 3, 1992 at Spokane Falls Community College, which cost $18.00. The top picture is the one in the scrapbook of pictures of EWGS Presidents, the bottom one is Donna and Jeanne Holder, another EWGS President. 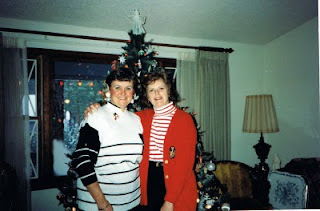 In the fall of 1990 my sister Jacque Lane and I took the beginning genealogy class offered by the Spokane Community College and the class was at Pines Junior High School. Donna was the teacher, and she told us about EWGS and said we should join, so we joined in 1991 (thanks for the advice to join, Donna!) EWGS has had wonderful group of people to befriend and so many very knowledgeable genealogists willing to share with newbies. If you live in the Spokane area, you are invited to take one or more Online Genealogy Classes from EWGS member, Miriam Robbins Midkiff, available through the Community Colleges of Spokane's Institute for Extended Learning. Claude William (Bill) Hire was EWGS President 2007-2009, the only EWGS President to serve three consecutive terms as EWGS President. Early by-laws did not allow any officer to serve more than two consecutive years as an officer, but that had been changed to four consecutive years before Bill became EWGS President. Bill also acted as treasurer after the death of Gary Taylor, so Bill was very busy until a new treasurer was found. Bill was born in Wolf Lake, Indiana to Thomas C Hire and Hermona J Magnuson. Bill grew up in Ligonier, Indiana and upon graduating from High School in 1965 he went to Indiana University and graduated in 1969 with a degree in Business Administration. Bill enlisted in the Navy in 1969 and spent his enlisted career in Hawaii working for the Commander Submarine Forces Pacific as a radioman. Bill got out of the Navy in 1973 and in 1974 applied to Navy Officer training. Bill was accepted and was commissioned an Ensign in October 1974. In December 1974 he married Marianne Iwasa whom Bill had met while stationed in Hawaii. 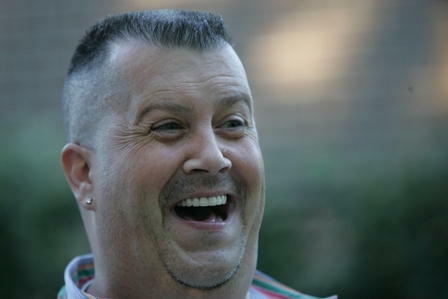 Bill served as a Surface Warfare Officer for 17 years and retired from the Navy in 1991 as a Lieutenant Command. Bill went back to school in 1991 at the University of Idaho and graduated in 1993 with a B.S. in Cartography. He went to work for Spokane County in 1994 as a GIS Specialist doing computer mapping and analysis and retired from county employment in July 2010. We raised two children, Peter and Katharine. Bill always had a passion for learning my family history. His genealogy researching really took off in 1985 after a couple of my aunts gave me handwritten pedigree charts for my Hire and Bender ancestors with accompanying handwritten notes with family group information for several families on one sheet. Bill needed a magnifying glass to decipher the tiny print. But that is all it took and Bill was off and running. After moving to Spokane in 1995 he joined EWGS. 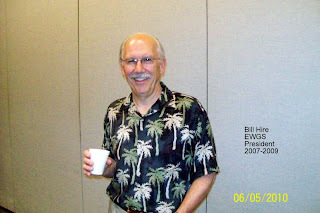 Bill was membership chairman for a year and in 2003 joined the EWGS board as Junior Trustee. The Spring 2007 seminar was Halvor Moorshead on May 5, 2007 at the Spokane Public Library and it was bring your own lunch and cost $20.00. 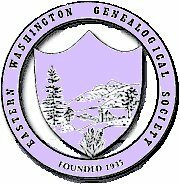 Also in May EWGS passed a motion to host the 2009 Washington State Genealogical Society Conference, and in June EWGS decided to hold the WSGS Conference at the Davenport Hotel and Bill signed the contract with the Davenport. We tentatively scheduled Halvor Moorshead and Megan Smolenyak Smolenyak for the speakers and planned on 200 people. The WSGS Board that had lost a ton on the last conference they held were all over EWGS for such an expensive venue and for two national speakers, so Halvor agreed not to come and we just had Megan Smolenyak Smolenyak for the national speaker. Still two more years to the WSGS Conference and so we planned a lot and hoped for 200 people. The October workshop was October 6, 2007 at the Southside Senior Center, cost $17.00. Next year the October workshop was October 4, 2008 at Mukogowa Fort Wright with Barbara A.H. Nuehring, cost $25.00. We liked Barbara so much that we had her back in May of 2010. The 2009 WSGS Conference was September 11-13, 2009 and Megan Smolenyak Smolenyak was great. The beginning genealogy classes were overflowing, and I think the last count was 199 people. Every one was surprised by the Davenport, and we nearly broke even after all the bills were paid. I paid $160 for the three days and had a great time. Bill was an energetic EWGS President and always willing to help others, have a good retirement Bill. Susan Beamer was EWGS President in 2006. Susan was born and raised in Omak, Washington a third generation Washingtonian. She is researching Beamers from Virginia to Washington, Bell from North Carolina to Iowa to Oregon and Washington, other surnames are Stull, Eightme, Millard and Franz or Frans. 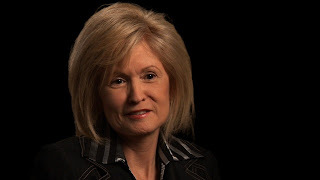 Susan has a BA and MA degrees in history and works as the Records Manager and archivist for Schweitzer Engineering Laboratories, Inc in Pullman, Washington. They make equipment and provide services for the electric power industry. EWGS only had one seminar in 2006 the October workshop was October 7, 2006 at the Spokane Library, with Michael John Neill, cost $20.00 plus $5.00 for asandwich lunch or bring your own sandwich.